Imagine working for an exciting entrepreneurial company where employees are committed to meeting big challenges and making a real difference. That’s Rogers, a leading communications and media company where people come to do great work. Right now we are looking for talented individuals to join our winning team where you will have a chance to innovate, grow and to do what really matters. Rogers Publishing Limited is Canada’s largest and most dynamic and diversified publisher of magazines and communications products. We offer a rewarding and challenging career that fosters team spirit, ongoing professional development and training, and provides competitive compensation and benefits. Countdown to PDC 2008: This is the Software + Services PDC, Plus a Hard Drive Chock Full o’Bits is a PDC Attendee’s Dream Come True! I’ve never been to a PDC. For that matter, I think the last big developer focused conference outside of the O’Reilly conferences that I’ve attended was JavaOne back in 2000. I have heard great things from people that attended PDC in 2005. There will also be the introduction of the Software+Services platform. There have already been parts of the platform available including SSDS, Office Live, Dev Live, and LiveMesh. It should be a very interesting few days. Kevin Merritt has a great suggestion for creating a Microsoft venture fund. This is not new, I wrote about my displeasure with the proposed Yahoo! deal back. Kevin has thought about a YCombinator-esque microfunding model. A three person team comprised of Ray Ozzie, Don Dodge and Dare Obasanjo would be the investment committee. Anyone can submit a 10-slide business plan. No NDA protection, which is the norm in the VC industry. Plans are reviewed once a quarter. Those that make it through the screening are invited to a 90-minute in person demo and pitch. At the end of the 90-minute demo & pitch, the three-person Ozzie/Dodge/Obasanjo investment committee makes an immediate decision. It’s pass/fail. You’re in or you’re out. American Idol style. You’re going to Hollywood or you aren’t. If you pass, here’s what you get: an investment of $100,000 cash plus $25,000 per founder, but never more than $175,000; all the Microsoft software you need; unlimited, free use of Microsoft’s cloud computing infrastructure for 3 years; mandatory office space for up to 5 people for the first year in either the Redmond or Silicon Valley Campus; all the non-sense administrative support services that typically saps a startup, a collegial environment working with other Microsoft funded startups. In exchange, Microsoft gets: 10% of the company in common stock with no special preferences or rights; your commitment to exclusively use Microsoft development software and operating systems for 3 years, other than with written exception by Microsoft; your commitment to deploy your software to Microsoft platforms first (i.e. if you build a mobile app, it has to run on Windows Mobile before iPhone). That’s it. Quid pro quo. Startups need cash, tools, infrastructure and elimination of noise and distraction. Microsoft needs access to innovation and a future generation of folks building software with Microsoft development tools and to be run on Microsoft platforms. My bet is that Microsoft will flat out buy some of the companies during their year of incubation. And if you assume each startup will have 3 to 5 people, even the ones that fail will produce a good stream of folks who could easily become employees. Microsoft probably already spends $50,000 per hire anyway, so it’s not really costing them much if anything at all. Oh, there’s one more important twist to help stem the tide of people leaving Microsoft to found companies or join startups. Microsoft employees in good standing having spent at least 2 years at Microsoft can quit their job and can be admitted into the incubator program with only a single approval from the investment committee. No business plan, pitch or demo are required. You’re in. Your prior contributions are your ticket. How many young entrepreneurs-to-be are willing to put in two good years at Microsoft just to get into the incubator program? I think more than a few. It’s a VC spin to the army college fund. It’s the Microsoft future entrepreneurs fund. This is a great, well thought out plan for putting $25M to work. The biggest questions for me are: how does the model scale around the world? What are the implications with respect to existing anti-trust agreements and funding companies? What are the areas, much like the Y Combinator 30 ideas, that are part of the initial investment thesis? It feels like without a clearly defined investment thesis that this is really a public relations campaign with entrepreneurial leaning technologists. What would you do with $44 Billion? Forty four billion dollars! It’s a huge sum of money. It’s a lot of money to pay to create Pepsi (apparently I prefer Coke). Others have provided their analysis of the deal. There is a mad rush to create a true competitor to Google in the rapidly growing online advertising market and now that a combined Microhoo/Yahsoft which would have created a set of highly trafficked sites and a huge amount of ad revenue, it is now off the table. Cash. Stock. Debt. It doesn’t really matter because $44 billion is a lot of money. It’s more than the combined venture funding in the US in software since 2002! The actual amount according to PricewaterhouseCoopers MoneyTree is closer to $31B. Interestingly, angel investors in 2007 put $26 billion into 57,120 ventures according to a study by Center for Venture Research at the University of New Hampshire! To hell with a $10 million dollar Facebook Application Fund. Never mind a $100 million dollar iPhone Fund. What about a new huge software fund aimed at funding new solutions on the Microsoft platform? Going on an acquisition spree seems to make a lot of sense, Kara Swisher calls it Project Granola, but imagine the power of creating MicroBook, FaceSoft AND all of the other properities already out there. Digg. TechCrunch. GigaOM. LinkedIn. Meebo. The list is almost endless. Building a open media ecosystem to compete with Google, Yahoo and others. What about investments in non-North American properties? It’s a great time to be building media properties. It’s not the first time that it has been suggested that Microsoft could benefit by encouraging entrepreneurs to build successful media businesses. With the $30 billion left over, it could be like Christmas in July for the geeks and venture firms of Silicon Valley. But Microsoft could scoop up a lot of good stuff, even if prices are high. Here’s a list: LinkedIn. Digg. Flixster. Slide or RockYou. Veoh. WordPress. Sphere. Sugar. Some international stuff. And more. Then, some noted, Microsoft would have to give massive financial incentives to those entrepreneurs to stay and thrive. Most importantly, it would have to keep its Redmond hands from interfering. Time to take the lessons from building a successful software business, and see if the proceeds can be used to build an online media business(es). Posted on May 7, 2008 May 7, 2008 Categories Articles, Entrepreneurship, MicrosoftTags Entrepreneurship, Microsoft, venture2 Comments on What would you do with $44 Billion? W00t! Leila and I are part of the MeshU schedule. We are co-presenting a session titled “How to Demo Like a Demon“. The original title was Raise Money, Win Friends and Get Laid (aka How to Demo and Pitch for Fun and Profit). The idea, we need to teach entrepreneurs how to present and communicate their ideas. We’re really trying to help improve the quality of pitches, demos and presentations. Co-presented with Leila Boujnane, Idee, Inc.
Boring! Get off the stage! How many times have you wished you could say this to a presenter at a conference? Or a demoer at DemoCamp? This workshop will help developers understand that doing demos is a marketing task because it generates demand for the software. Technologists and designers need to be able to create demand for their ideas. They need to be able to tell compelling stories that convince audiences that there is ‘wow’ in what they are doing. Successful demoers are more likely to raise money, have friends, and get laid. I’ve talked about my awe of the MeshU line up previously, and now that the line up includes me, no serious, the rest of the lineup is fantastic. The rest of the MeshU lineup includes a fantastic program. If you’re looking for a meaningful conference in Toronto, MeshU is only $239. Live Mesh was launched yesterday at Web2Expo in San Francisco. I’m really excited about Live Mesh as a platform. It really is one of the first services above the level of a single device. The integration of experiences across devices is really interesting and important. I started to realize the power of creating a device mesh when I switched from my Blackberry to a Windows Mobile device and Microsoft Exchange. I am able to access my email service using my Palm 750, my Mac Book Pro running Entourage, my new Dell m1330 or my old Thinkpad x60 running Outlook, or when I’m connected over the web running Outlook Web Access. The devices are really irrelevant to me, what is most important is my data. My contacts. My calendar. My email. Live Mesh is an early platform that allows the abstraction of data and data synchronization with applications, the web, and the cloud. It is a platform for developers to begin building the next generation of applications for the web, devices, rich clients, gaming platforms, media devices, etc. Services Are the Core of the Platform – the Live Mesh platform exposes a number of core services including some Live Services that can all be accessed using the Live Mesh API; these include Storage (online and offline), Membership, Sync, Peer-to-Peer Communication and Newsfeed. Same API on Clients and in the Cloud – the programming model is the same for the cloud and all connected devices, which means a Live Mesh application works exactly the same regardless of whether it’s running in the cloud, in a browser, on a desktop, or on a mobile device. Open, Extendable Data Model – a basic data model is provided for the most common tasks needed for a Live Mesh application; developers can also customize and extend the data model in any fashion that is needed for a specific application. Flexible Application Model – developers can choose what application developer model best fits their needs. .
Mike Zintel, from the Live Mesh team, describes the locus of control is with end users. People are given a platform where they have the control over the devices, the communication, the storage and the membership to the network. The mesh is the foundation for a model where customers will ultimately license applications to their mesh, as opposed to an instantiation of Windows, Mac or a mobile account or a web site. Such applications will be seamlessly installed and run from their mesh and application settings persisted across their mesh. 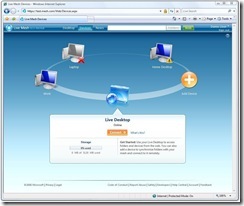 The device ring inside of the Live Desktop is a simple visualization of the mesh, and provides a view of all devices and current device availability. The Live Mesh platform provides the ability for applications to connect to any other device, regardless of network topology (network transparency), within the mesh. This infrastructure enables the Live Mesh Remote Desktop experience today. It is a great way to start to build above the level of a single device. Being able to abstract devices, membership lists, connections between devices, and then an underlying pub/sub infrastructure for awareness and sync is a very empowering framework. I can’t wait to start enabling more of my personal data between my devices (namely music, videos and photos shared between my laptops and music players, and if I’m lucky my TiVO because I can already share from my Mac to my XBox360 via Rivet or Connect360). Ewan Spence covers the hackable power of the underlying “RSS and XML derived data exchange”. This looks like a really good first direction for a Software+Services platform that enables developers beyond the context of a single device. As Live Mesh is a limited Technology Preview, but it is a great start to building cloud connected applications. Yes, I know that I’m technically responsible for the Microsoft Canada sponsorship of MeshU, but the lineup hadn’t been announced when we made the decision to find the sponsorship dollars. With great presenters like Avi Bryant, who gave one of my favourite DemoCamp presentations at DemoCampToronto5, will be presenting. If you haven’t seen the DabbleDB 8 Minute Demo I strongly recommend checking it out. To top it off, MeshU registration is only $239 and in Toronto. Posted on March 31, 2008 April 15, 2008 Categories Articles, Conferences, Technology, TorontoTags avibryant, danielburka, johnresig, leahculver, mesh, meshu, ryancarson10 Comments on MeshU looks awesome!